I usually have my salmon either grilled or sautéed but there are many other ways that salmon can be incorporated in a meal. For instance, in curries, stews and soups. So this time I decided to try something different. 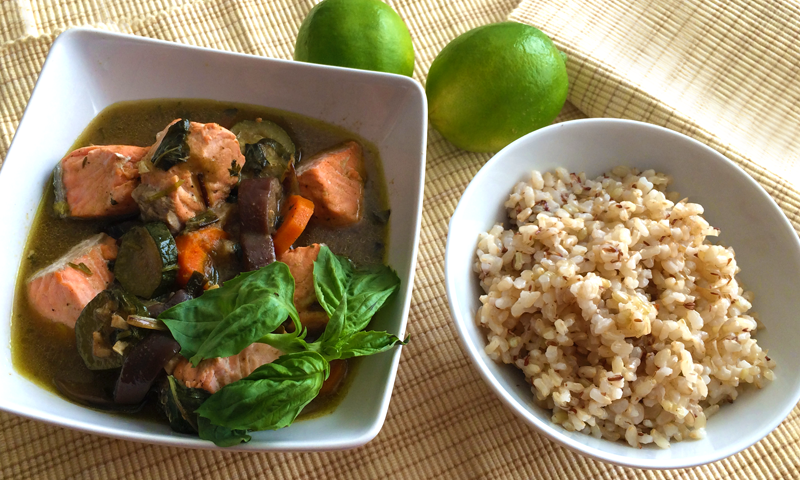 This entry was posted in Food, Gluten Free, Health, Life, Main Dishes, Recipes, Uncategorized and tagged Brown Rice, coconut milk, Curry, Food, Gluten Free, Green Thai Curry, Recipes, Salmon, Seafood. Bookmark the permalink. Interesting sauce, the green curries are usually very light coloured, could be due to heavy coconut cream used instead of milk? Sounds like healthy version of a heavy meal and I like how you have used brown rice too.